Church Members Were Called "Disciples"
According to Acts 13:52 and Acts 20:7, what were the members of the church called? _______________________ The word "disciple" means "one who learns, a learner." In Matthew 11:29 the Lord Jesus invites us to become His disciples (learners): "Take my yoke upon you, and __________________ of (from) Me." Have you accepted this invitation? Those who have accepted this invitation are called "D__________________ (LEARNERS) of the L_______" (Acts 9:1). Read Matthew 10:24. Just as a servant (slave) must have a _________________ (master), so also a disciple (learner) must have a __________________ (teacher). A disciple must learn from a teacher. Are there learners and teachers in your school? Do you have learners and teachers in your Sunday School? Who is your Sunday School teacher? ____________________ Therefore you can say, "I am a disciple of ___________________________ because he/she teaches me and I learn from him/her!" In Bible times, the teacher/disciple relationship was much more than classroom instruction. Often the disciple would work with his teacher, walk and travel with his teacher, eat with his teacher and spend much time with his teacher. The disciple learned not just by what his teacher said to him (verbal instruction), but he also learned by observing his teacher. The teacher was an example to the student by the way he lived. The disciple would learn from his teacher's lips but also from his teacher's life. According to John 3:2 who is the Teacher who has come from God? ____________________ Read Matthew 5:1. Who came to this teacher? ______ ___________________ (His learners). And thus He opened His mouth and ________________ them (Matthew 5:2). Disciples must be taught by a teacher! As we study the New Testament we discover that disciples can also be teachers. In Matthew 28:18-20 the Lord Jesus spoke to whom? (The answer is found in verse 16) _______________________________ He told these disciples to "GO, therefore, and __________________ all nations" (v. 19). The word "teach" in this verse means "make disciples of." The Lord told His disciples to make disciples (learners) of all nations! And the only way to make disciples is to teach them: "_____________________ them to observe _______ things" (v. 20). This is explained by the diagram. 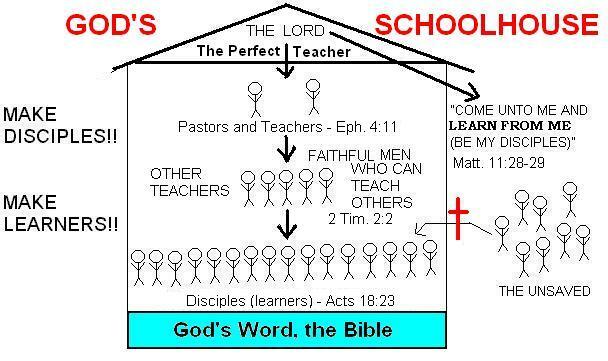 The above diagram shows us that disciples can also be teachers. For example, the Apostle Paul was a disciple of the Lord Jesus, but he was also a teacher of Timothy. The following matching problem will help you to understand the teacher/disciple relationship. The diagram above will help you as you answer the following matching problem. 2. ______ Disciple of the Lord Jesus and Teacher of Timothy (Gal. 1:12; 2 Tim. 2:2) B. "others"
3. ______ Disciple of Paul and Teacher of "faithful men" (2 Tim. 2:2) C. "faithful men"
4. ______ Disciples of Timothy and Teacher of "others"
Therefore we can think of the local church (the local assembly) as a schoolhouse where there are teachers and learners and where disciples are being made. 1. ______ The word "disciple" means "one who teaches." 2. ______ The Lord Jesus has invited all men to come unto Him and be His disciples (Matthew 11:28-29). 3. ______ Just as a slave must have a master, so also a disciple must have a teacher (Matthew 10:24). 4. ______ Disciples can never be teachers. 5. ______ The Lord Jesus Christ commanded His disciples to "teach" or "make disciples" of all nations (Matthew 28:19). 6. ______ We learn in Acts 14:20-21 that Paul and Barnabas disobeyed the Lords command in Matthew 28:19-20. ______ The Apostle Paul was a disciple of Timothy. Timothy was a disciple of the Apostle Paul (1 Timothy 2:2). 8. ______ The Pastor must be a teacher (Ephesians 4:11). 9. ______ Every single member of the Church needs to be taught except for the Pastor. 10. ______ The Lord expects us to learn and to grow up so that we will be able to teach others also (Hebrews 5:12).